Pull up your FBA or Merchant inventory in InventoryLab and click Export. Open up your exported file and update the cost/unit, supplier and/or date purchased information. Note: Cost/unit can NOT have a $ character and date must be Month/Day/4 digit year. When you are ready to import go into your FBA inventory in InventoryLab and click Import. You will see a screen that asks you to choose the file you want to import. Choose your file and click Next. 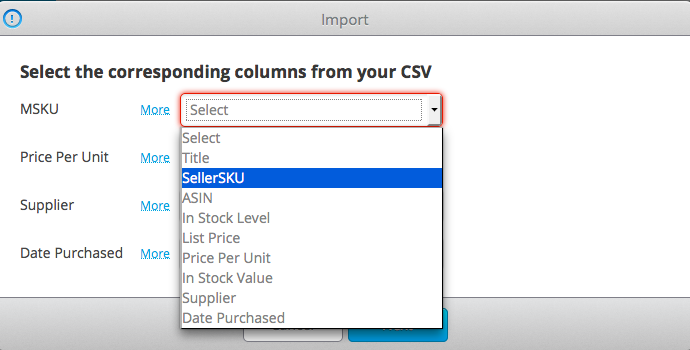 The next screen allows you to match the fields in InventoryLab with the columns in your .csv file. The required fields are in Red. 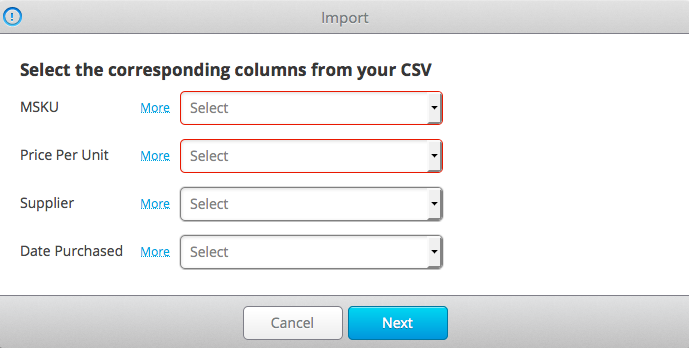 Select the correct columns for InventoryLab to import from for each field and click Next. That’s it! You should now receive an Import Success message. Note: Imported changes can take up to 20 minutes to take effect on your account.